MANI RATNAM'S NEXT WILL HAVE 7 SONGS? Vairamuthu, the legendary Tamil poet is someone who is very selective with the kind of songs that he writes. He apparently tunes himself to the ever changing trends and lifestyles of the present generation of youth. Having apportioned greater time and thought to his literary sojourn last year, he is investing more of his time this year in the magical screen world. He will be associating with some of the big films that are waiting to rule the year. Vairamuthu’s film lineup includes Vijay 60, Mani Ratnam - Karthi project, Lingusamy’s Tamil/Telugu bilingual starring Allu Arjun in the lead role, Suriya’s 24, Vijay Sethupathi’s Dharmadurai, Vishal’s Marudhu, Vikram Prabhu’s Wagah and also Suseenthiran’s next film with Udhayanidhi Stalin. 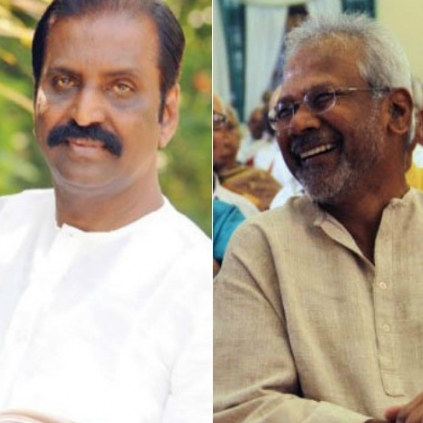 Now the latest we hear is that the untitled Mani Ratnam film starring Karthi and Sai Pallavi in the lead role might have 7 songs penned by Vairamuthu. When AR Rahman, Mani Ratnam and Vairamuthu join hands, you expect nothing short of a magical album. We expect the trio to raise the musical bar once again. Behindwoods wishes Vairamuthu a wonderful 2016! People looking for online information on Mani Ratnam, Vairamuthu will find this news story useful.